RAINDROPS ARE FALLING ON MY HEAD.. 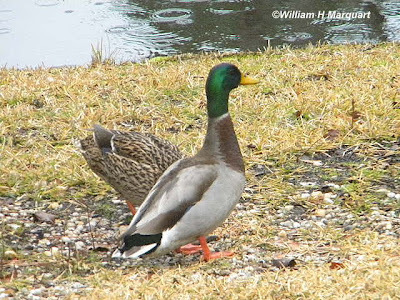 This morning we had such a flurry of visitors not the least of which were the Mallard Couple. 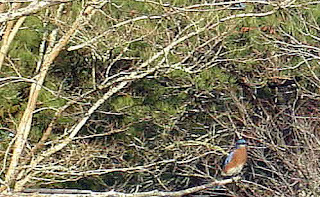 They have been nesting near our yard for all 5 yrs. we have been living here and are devoted to one another. 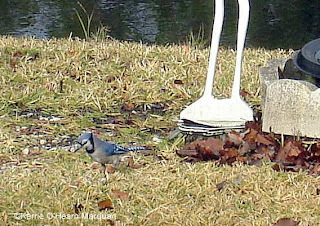 The female came right up to the house to eat fallen seed from the feeder while her mate kept watch from afar. I just love seeing them so much! 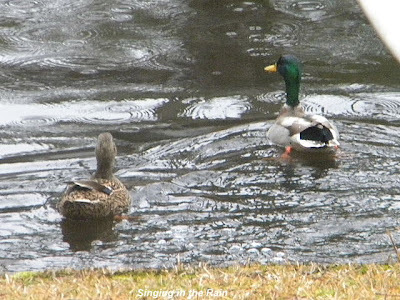 The rain drops falling on their heads did not seem to bother them at all-ha! 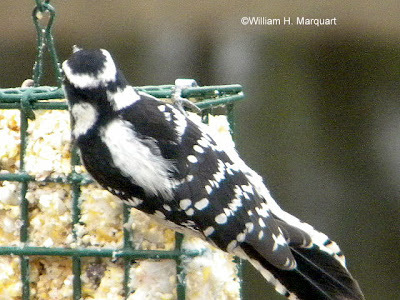 Next came a Male Downy Woodpecker to the suet. 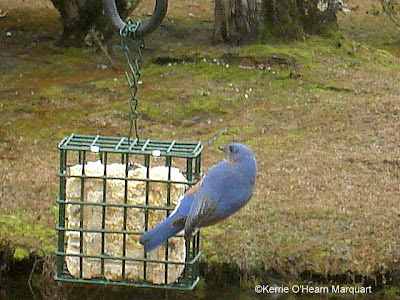 He was so intent on his work to get the suet and seed and very cooperative with our camera shots through the den window. Doesn't he look wonderful in his red robe and designer shades-ha! Next, I have a challenge for you! 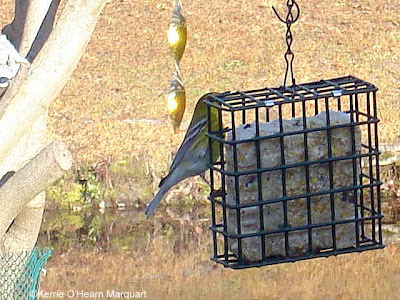 We were unable to identify this bird on the Suet. 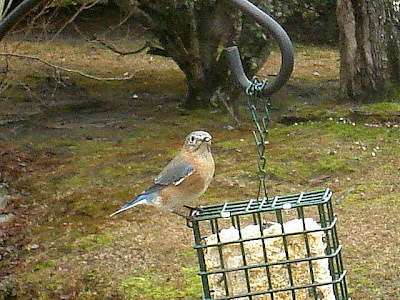 It was the size of a Bluebird but much darker blue. 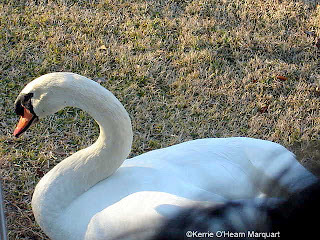 The head was very dark gray with a white stripe starting at the back of the crown and down into the neck feathers. 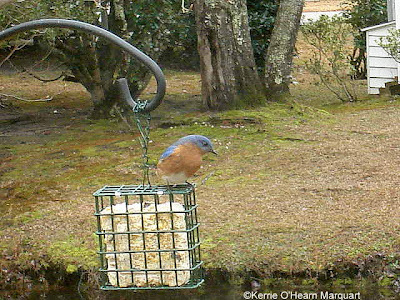 We could not find anything like this bird in all of our birdbooks here. If you can identify him or her, please let us know! GOOD MORNING! 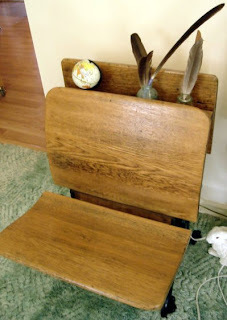 I am flying high on all of the wonderful comments on my poetry and visits from my sister bloggers! 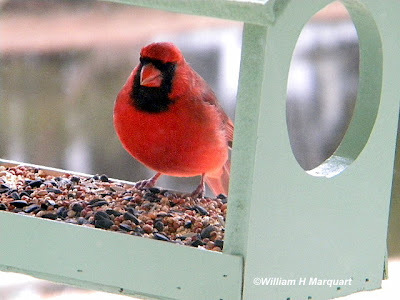 I am puffed up like the Robins that visit our back yard and must be much more humble! Thanks to all of you that have been so encouraging and loving in your comments! 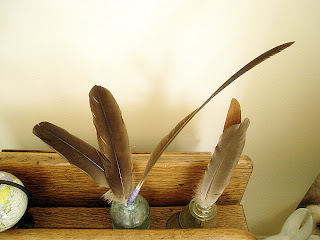 Because of all the birds that frequent our yard, I have collected feathers over the past 4 1/2 yrs. 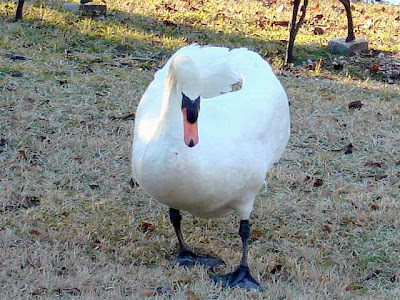 I have made pens from Canadian Goose Feathers and decorated gourds that I have grown with swan's fluffy short feathers. After they spend a day of grooming, I can always find a few at the water's edge. 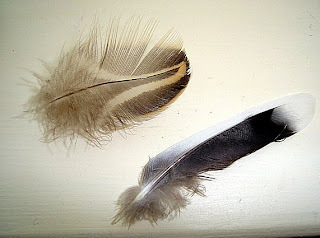 I wash them gently with dishwashing liquid, dry on a paper towel and then wave them like a wand in the air to fluff. 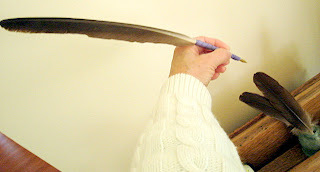 A Large goose feather with the inside of a Bic Ball Point Pen inserted into the shaft and then ribbon wound around the outside for a grip. No, I am not left handed but since taking the photo myself, I clicked with my right hand, LOL! 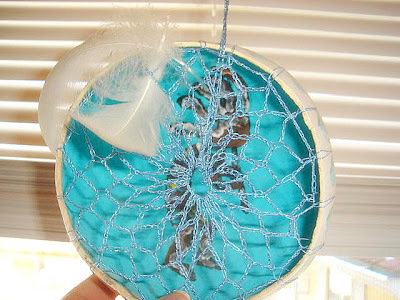 My Gourd with blue background and a Kokopeli painted inside (the happy Flutist) embellished with metalic blue crochet thread and fluffy Swan feathers. 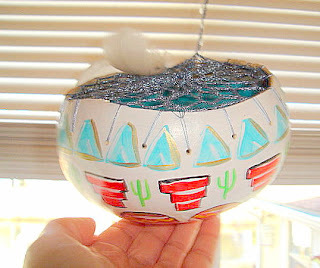 Side view of my feathered, painted gourd. I hope you enjoyed my Feathered Friday, Come by and visit again soon! I am going to post a PINK SATURDAY for the first time tomorrow!! 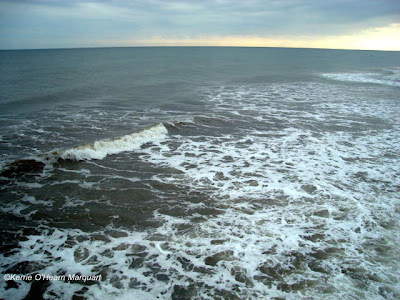 Have a wonderful weekend and if you enjoyed my post, you might also like my TWO HAPPY Blog link in the sidebar. I HAVE BEEN SO THRILLED WITH THE RESPONSES TO MY LAST POEM! I must tell you I hesitated to post it because I felt it was so personalized and lo and behold, many of you could identify with it completely!! 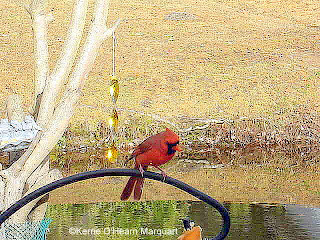 Thank you so much for all of your wonderful visits and comments about the poem and the bird photos. You all have made my day for sure and encouraged me to share more. And hug your face all tanned. With every year and every minute. To run and buy me flowers? And holds you in her heart. Where did our Youth go? (Written in 1980's Category, "Love and Marriage"
All that was of you and me? And two horses were tied near. Til we met again that week. Whenever we used to court? Acting like a detective for hire! But we continue to plan and dream. Were we ever really that young, 20 and 18? Were you really that lean? Our hearts pounding as they still do! And I was your only girl. As the rest of our lives unfurl. The boy of my youth so fair. 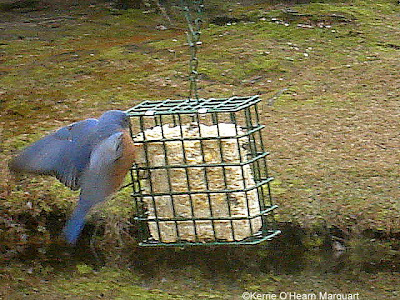 It's all about Bluebirds today! 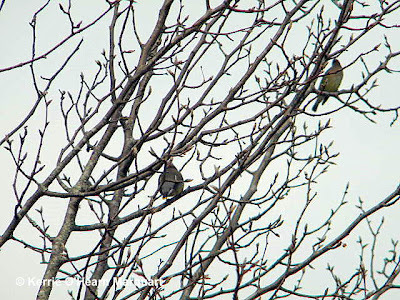 They were in a flurry this morning about 10:30 a.m. eating the suet and filling the Bradford Pear trees, rooftops and ground with their beauty! 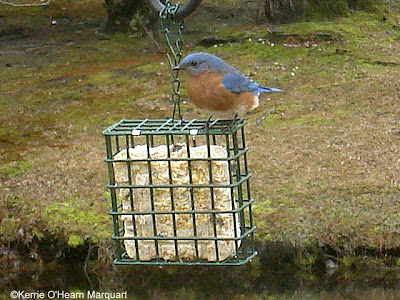 I may have to start a blog just for my Bluebird, Swans and all of the other beautiful birds and animals that bless us with their presence every day. IT JUST HAS TO BE SPRING! 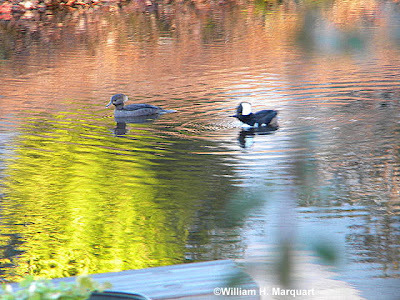 Yesterday and today we have been blessed with birds and water fowl in abundance!! 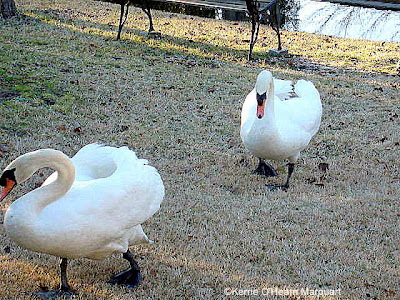 The Swan Couple came late afternoon yesterday and boldly came up to beg for food. They posture the whole time with threats and the male makes gutteral sounds from his throat but they still beg for food. 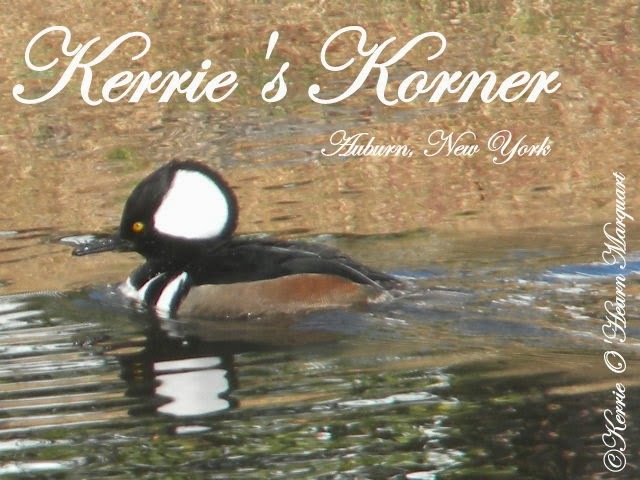 Their webbed black feet are enormous and even have holes worn through in some places. 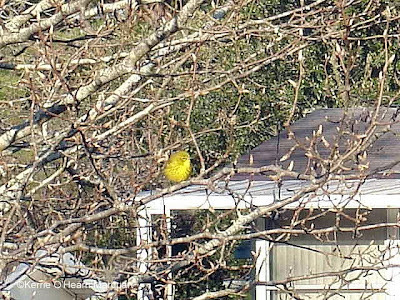 This morning brought the Bluebirds looking over the new house Bill made, Yellow Warblers, Chicadees and Flicker. The yard was just a congested airway of landings and taking off. 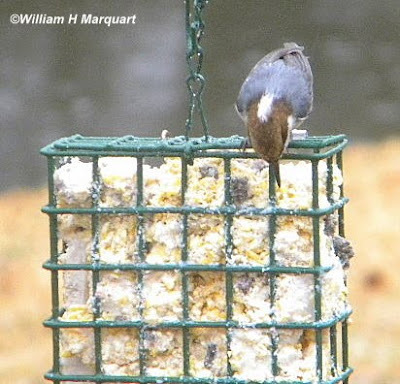 They all love to look at the houses and eat the hanging suet and seeds. Such a joy for us! WOW! 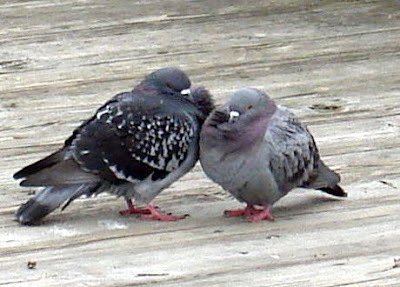 I am on a roll with these bird pictures! 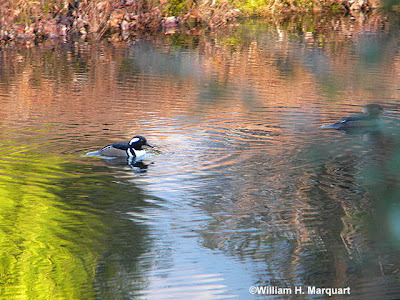 This morning when I got up there was a male and female Hooded Merganser couple diving in the little lake! These are so beautiful in life and of course my pics do not do them justice! I never saw one in real life until I lived in SC and I still get a thrill to see them. 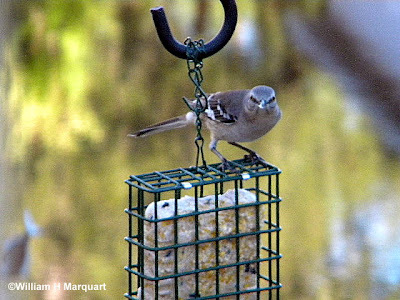 This is the first time I have ever seen the female so it was a treat. 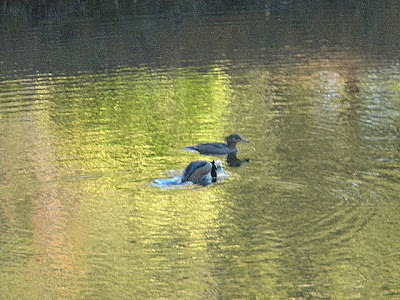 They dive down to get food and pop right back up, so much fun to see. 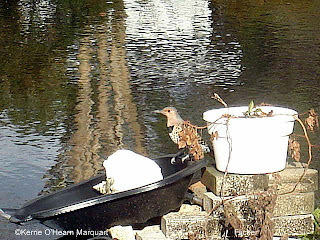 This one shows the female with her hood raised! 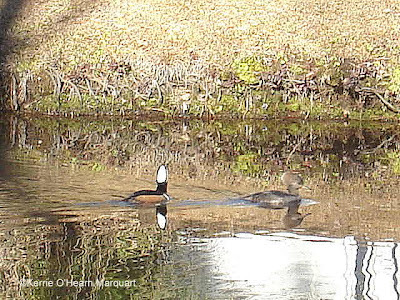 I love this one of the Hooded Merganser Male and also the background. Hubby took this one and a couple more below. 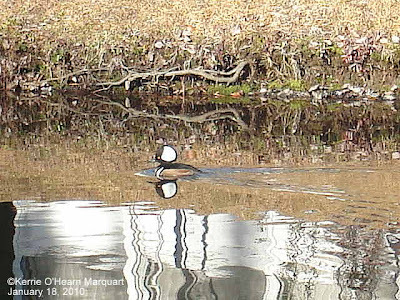 In this one the male has his head underwater. I hope everyone is having a wonderful Monday to start the week. "The light of the eyes rejoices the heart and good news refreshes the bones". 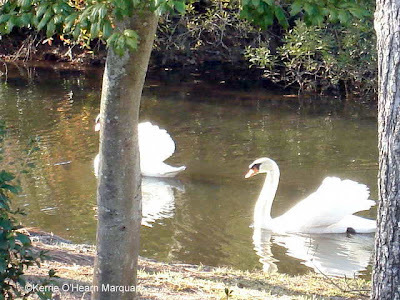 Every day is a delight for what we see through our eyes observing God's wonderful creatures. 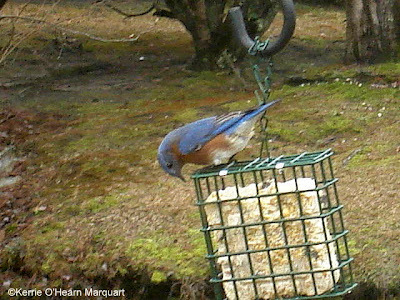 The novelty never wears off when we see the beauty and color of a bird, hear its song, see it in flight. Everywhere I look there is a picture! 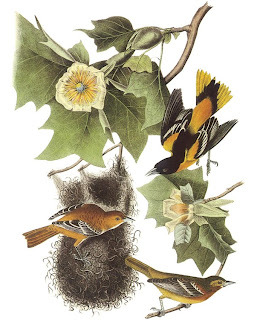 My Dad belonged to the Audubon Society. All of his life he loved and studied birds and I often think of how he would have loved living here with all the wild birds! He also was an artist and drew birds all the time. I loved seeing his creations that he would draw from life looking from his kitchen window and porch. 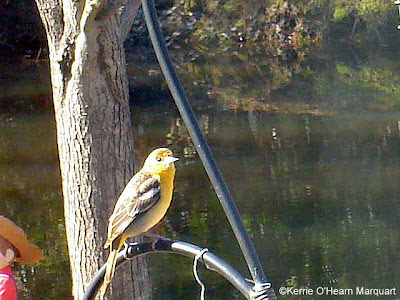 One time I visited him and he had a cage full of finches! I don't have a clue how he captured them but he drew them in different positions and then let them go again. I miss comparing notes with him on what I have seen and he has drawn. I have very few of his sketches and some are not complete but I do love and treasure them. 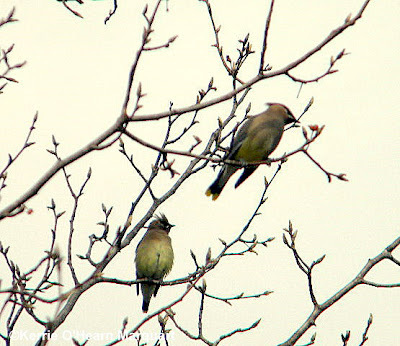 THIS MORNING'S VISITORS IN THE OLD BRADFORD PEAR TREE were Cedar Waxwings on their way migrating back North. A good sign! The tree was filled with them and they seemed to be eating this years buds but not enough to injure the blossoms to come. I did not capture the beautiful colors on their wings and tail or the mask across their eyes. The sky was too overcast and I took the picture through the window as I often do. But they were pretty none the less and welcome. They were crested and beautiful. 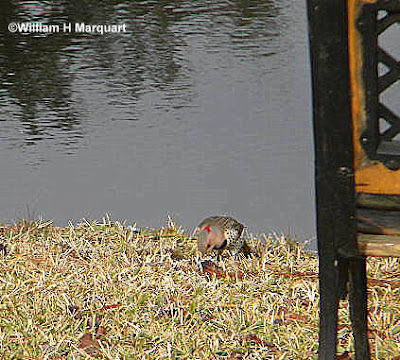 A few Robins also graced the yard and looked very lean. A good wife who can find? 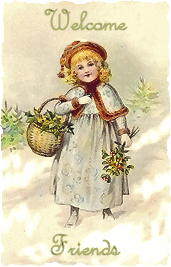 Bringing smiles and cheerfulness to a winter-weary heart of mine. With puffy little wisps of white that accent you. When I know that you are very cold, yet so exciting! and gulls bob up and down, such a pretty sight. ICE ON THE POND MORNING! !